Dr. Trevor has a passion for teaching our patients and the larger community about regaining, maintaining and building health. 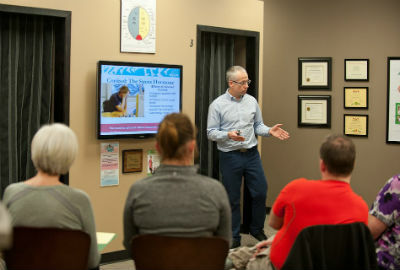 Whether an in-office workshop, a corporate talk, a chat with a local weight loss group, speaking at health-focused conferences or a learning session at an elementary school, Dr. Trevor helps you learn in easy-to-understand terms and easy-to-adopt ways what it takes to unlock your true health and performance potential. We can also customize a program to suit your particular learning outcomes or address a specific health-related situation whether at your workplace, in your school or for your non-profit organization. We also hold exciting events at our office, like our annual Health and Fitness Challenge, open to patients and non-patients alike. These events are designed to motivate, encourage and support those looking to make key changes to their health and well-being. Contact our office today to find out about our upcoming events or to book Dr. Trevor for a speaking event.